Shaykh-ul-Islam Dr Muhammad Tahir-ul-Qadri chose the topic of rights of parents and blood relations for his special address to the thousands of inmates of Itikaf City on the night of 26th of Ramadan. He said that Allah Almighty has clearly and manifestly ordained the believers to fulfill the rights of parents. Quoting a Hadith, he said that serving the parents and talking to them in a pleasant way and on topic of their interest that pleases them is as rewarding an act as Jihad. He advised the youth, both men and women, to spare quality time for their parents in the same way as they take keen and avid interest in the matters of their own children. Dr Tahir-ul-Qadri said that the Holy Prophet (SAW) urged a companion to serve his aging parents instead of going to Jihad. He also gave him glad tidings that if he served his parents well, he would get as much a reward as one gets by going to Hajj and Umrah. He said that Hazrat Owais Qarni (RA) could not travel to Madina and perform Hajj because he was busy in the service of his old mother. He could not get the status of a companion for his inability to meet the Holy Prophet (SAW). When Hazrat Owais Qarni (RA) went to perform Hajj after the passing away of his mother, Hazrat Umar Farooq (RA) requested Hazrat Owais Qarni to pray for him in accordance with the saying of the Holy Prophet (SAW). A companion was making a ‘Taba’ee’ pray for him. Hazrat Owais Qarni (RA) got this status due to service of his mother. Dr Tahir-ul-Qadri said that the Holy Prophet (SAW) advised those whose fathers pass away to mete out excellent treatment towards the friends of their fathers. He asked the youth to stay connected to a mission with which their parents had been connected. It is a mission through which we got the lesson of respect and reverence for the Holy Prophet (SAW), piety, cleanliness and goodness, adding that it is their responsibility to stay in touch with this mission. 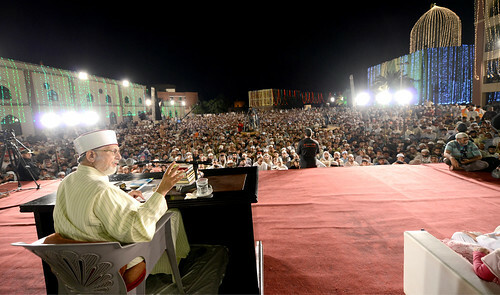 Dr Muhammad Tahir-ul-Qadri said that he, who knits blood relations, gets connected to Allah Almighty. Likewise, a person, who does no good to his blood relations and does not take part in their sorrows and worries, Allah says that He disconnects Himself from him. Allah Almighty says that His Name is ‘Rehman’, The Merciful and He named blood relation as ‘Rehm’. Allah derived this name from His Own Name. Thus he who does not value and respect his blood relations creates enmity with the Lord of Heavens because blood relation is connected to the heaven. He who wishes his life to be blessed and his sustenance and life to be increased should mete out an excellent treatment of his blood relations. Dr Qadri said that the pious deeds of the people would be returned to them on the Day of Judgment who donated for others by turning their back on their blood relations. Throwing light on the Holy Prophet’s (SAW) love for children, Shaykh-ul-Islam said that he (SAW) would make Hazrat Imam Hassan (RA) and Hazrat Imam Hussain (RA) sit on his shoulders. When the Prophet (SAW) would bow down in prostration while offering prayers, both of them would sit on him. He would not rise from prostration unless both of the princes left him. In the end, Dr Tahir-ul-Qadri said that the faith was not the name of rituals but it is a totality. He said that ‘Seera’ of the Holy Prophet (SAW) would have to be adopted in every aspect of life, adding that if it happened so, one would get connected to the world hereafter while one is resident of this world. The address of Shaykh-ul-Islam was broadcast live from the women’s side of Itikaf City through ARY News, ARY Zauq and Minhaj TV. Before the speech of Shaykh-ul-Islam, renowned Naat Khawan of Pakistan Farhan Ali Qadri recited naats in his unique and characteristic style. Other Naat Khawan also took part in the Naat Khawani.